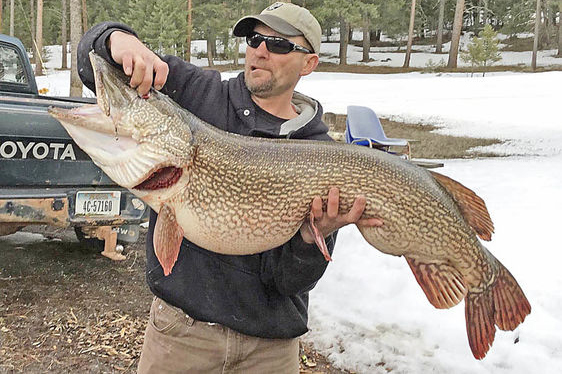 Montana Ice Angler Reels in Trophy Pike–Potential Record! Jimmy Zander of Potomac recently found the “wall hanger” he has been searching for his whole life, according to SeeleyLake.com. On Monday, March 26th, at an area lake, Zander caught a 47-inch, 33 pound, 8 ounce northern pike. After Zander first brought in a four-pounder, he noticed his tip-up was really “zinging”, which meant he had a big one. After a 10-minute fight, he got the monster through the ice hole. “It wasn’t real easy,” Zander said. He brought it through the two-feet of ice by laying back and pulling it. Congratulations to Jimmy Zander on this trophy pike! Apparently, if it is certified, it could set a record for the local lake in which he caught the giant!